Miss Hannah Bloomfield’s Receipt Book of Cookery has been in the collection of the DAR Museum since 1963. It was donated by Louise Kennard Haynes, a DAR Member. This manuscript recipe book was compiled by Bloomfield sometime before her marriage to General James Giles in 1784. Like many young women in the 18th and early 19th centuries Bloomfield recorded a list of recipes she thought would suit her household after she got married. Bloomfield copied her recipes, probably from the popular cookbooks of the day like Susannah Carter’s The Frugal Housewife or Hannah Glasse’s The Art of Cookery Made Plain and Easy. Bloomfield might have also copied recipes common in her own household growing up, or even from friends. While reading through the manuscript, it becomes evident that Bloomfield liked puddings. There are 20 receipts for various types of puddings, both boiled and baked. She also included a few different recipes for Queen Cakes. These dense small cakes were very popular and common in the 18th century and throughout the 19th century. They were baked in small pans in the shape of hearts or stars, and other shapes. These little tin pans can be found listed in estate inventories and in store inventories into the early 20th century. Queen cakes are similar to Portugal cakes, another type of small cake. 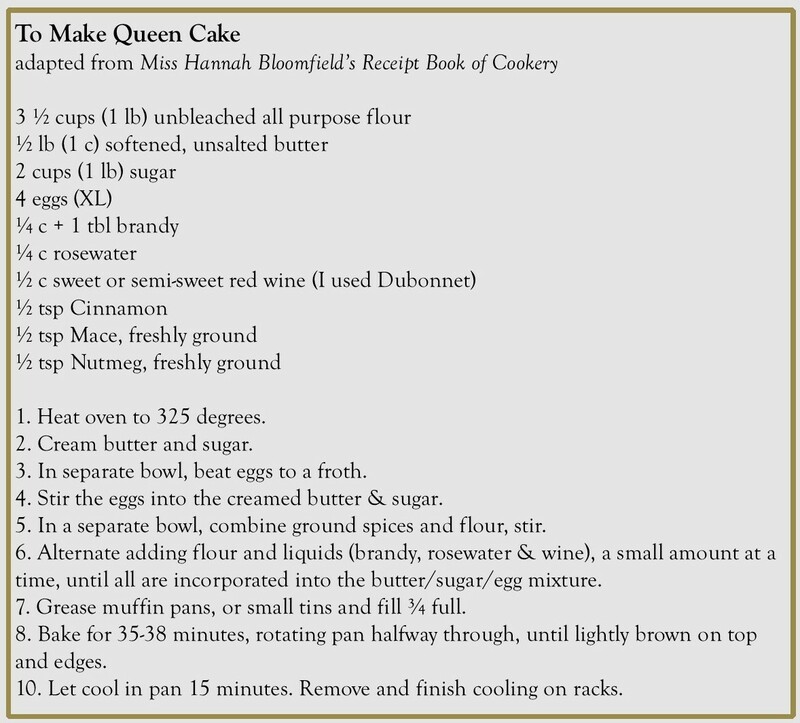 Queen cake recipes can be found with or without currents. Bloomfield included one of each in her manuscript. 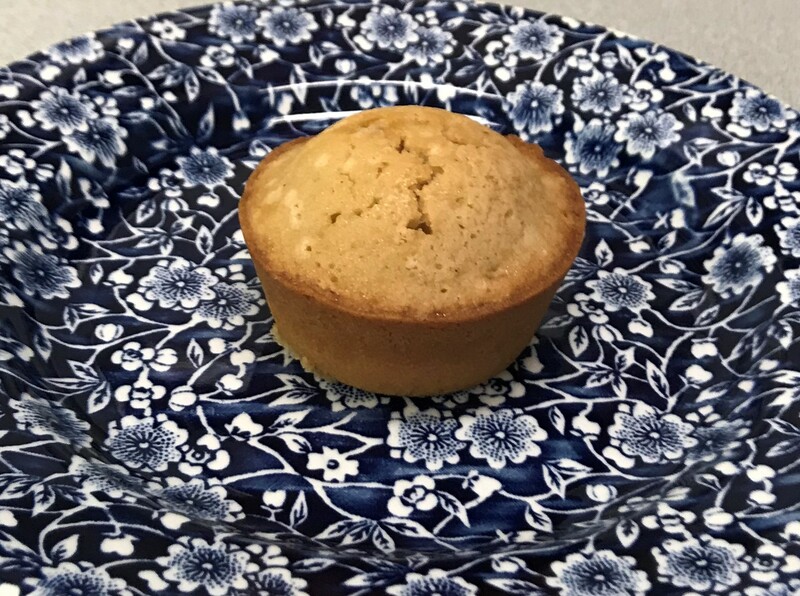 I decided to try one of Bloomfield’s recipes for Queen Cakes. Early recipes, especially ones from the 18th century, require some adaptation. The standard measurements that are required in modern recipes did not exist in the 18th century. Instead, I had to interpret the instructions, considering what was available at the time the recipe was written, and what will work with our modern ingredients. In her recipe for Queen Cakes, she tells us to take a pound each of flour, butter and sugar. I used a pound of flour and sugar, but a pound of butter seemed like it would make the batter too moist. I cut the butter to ½ pound. A gill is equal to about 4 fluid ounces. Her recipe calls for a gill each of rosewater and brandy, and two gills of wine. That would be about 16 ounces of liquid, and lead to a very soupy batter. I reduced those amounts as well. And what is a “middling quick oven”? I know that Bloomfield did not have the luxury of a programmable-to-the-degree oven like we have today. I interpreted that temperature to mean a 325 degree oven. I baked them for 35-38 minutes, and they were nicely colored when finished. This experiment was a success! Although I did not have fun-shaped pans to bake them in, a muffin pan worked very well. 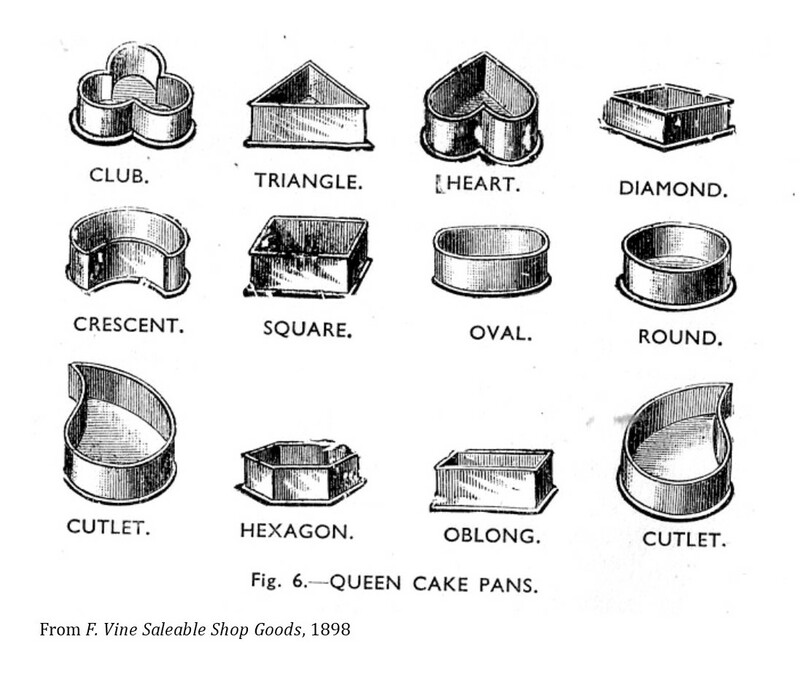 Here is my adapted version so you can try making your own 18th century Queen Cakes.